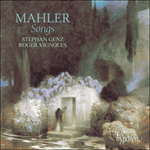 This song comes from the Lieder und Gesänge of 1892, a volume that included nine early settings of texts from Des Knaben Wunderhorn, the massive collection of German folk-poetry gathered by the poets Achim von Arnim and Clemens von Brentano, which was to prove such a seminal influence in the development of Mahler’s sound-world. 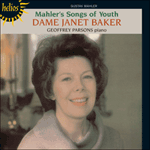 It also included five separate songs to other texts, but it is clear even from these that Mahler was already leaning towards an alfresco, folkloric context for his music. This is audible in the chirruping lark and humming bees of Frühlingsmorgen, a song that seems always on the verge of breaking into a full-blooded dance, but finally gives up, out of consideration for the sleeping sweetheart. Frühlingsmorgen est un lied qui ne cesse de frôler la danse vigoureuse mais qui, finalement, cède par égard pour la bien-aimée endormie. Mit Zweigen, blüthenbehangen: Steh’ auf! Steh’ auf! Was liegst du im Traum? Die Sonn’ ist aufgegangen! Steh’ auf! Steh’ auf! Die Lerche ist wach, die Büsche weh’n! Die Bienen summen und Käfer! Steh’ auf! Steh’ auf! Und dein munteres Lieb hab’ ich auch schon geseh’n. Steh’ auf, Langschläfer! Langschläfer, steh’ auf! with blossom-laden branches: get up, get up! Why do you lie dreaming? The sun has risen! Get up, get up! The lark is awake, fluttering its plumage! The bees and beetles are humming! Get up, get up! I have already seen your sprightly love. Get up, sleepy-head! Sleepy-head, get up!